So, what is the best vertical climber machine? 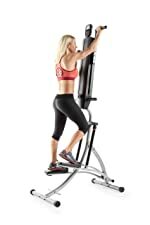 The best vertical climber is a no impact and joint friendly exercise machine that will support most weight classes, offers smooth operation and easy functionality, provides additional resistance levels to keep workouts challenging, is portable and easily stored, has a solid structure with quality parts yet still very affordable. In this comprehensive guide and review, we will list our top 6 best vertical climber machines that you can use in the comfort of your own home or apartment. If you have come to this site it is more than likely because you are interested in learning more about vertical climbers and possibly purchasing one for your home gym. We know how difficult and time consuming it can be to find a good quality vertical climber. So we have made it our goal to help make this process easier for you by providing you with a list of what we believe to be the best vertical climbers. Furthermore, you will find all the product information we could find for each climbing machine, a comparison list with top features, and some personal guidance and tips to help you along the way. And if that’s not enough, we even took the liberty of providing you with an Editor’s Choice and Runner-Up Award. Should you Buy a Climber Machine? Which Climber should you Buy? The vertical climber is a great way to lose weight while also toning your body, strengthening muscles, and getting your heart rate up for cardiovascular health. Unlike a treadmill that only stresses your lower body, the vertical climber will provide for a full body workout. Furthermore, these climbers have a very small footprint and take up far less space than treadmills, indoor exercise bikes, or most any other exercise machine, making this the perfect exercise machine to add to your home gym! A vertical climber machine is a highly functional machine made to utilize the same movements as rock climbing. With the vertical climber, you get a full body workout, which includes both arms and legs, and your abdominal muscles. The movements on this machine are very natural and low impact making it easy on joints. The vertical climber burns fat faster and more efficiently than most other cardio machines. It can burn more calories than a bike and twice as many as a treadmill. This machine will absolutely get your heart rate up and is perfect for high-intensity interval training for serious fat burning results. A study conducted at the Department of Kinesiology and Leisure Studies, Washington State University shows just how much more effective the climbing machine is than both the treadmill and rowing machine. These machines are no joke when it comes to burning fat! Weighing only about 40 pounds, and a footprint on average of only 4 by 4 feet, these vertical climbers can be conveniently moved and placed virtually anywhere in your home. If Lebron James uses a vertical climber as his favorite cardio exercise machine, you can’t go wrong! Shopping for a vertical climber machine online will be much more convenient and less time consuming, but can also be very overwhelming. With literally hundreds of online sites and so many different vertical climber machines to choose from, how does one decide which vertical climber is the best choice for you? You could spend hours of searching the net and reading through lengthy product descriptions and still not know if you’re making the right buying decision. We will not only help you find the best vertical climber machine to use in your home, but we will also cover some basic questions you should be asking yourself before you make your decision. Should you Buy a Vertical Climber Machine? 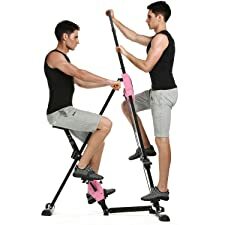 Before you go spending your hard earned money, you should be certain that you or your significant other will be using this new exercise equipment. Or will it end up collecting dust? Let me add, I have been actively involved in health and fitness for over 30 years and have experienced and see a lot. And I can tell you I have seen many workout machines, especially treadmills, wasting away, collecting dust in corners or back rooms. I have seen them in neighborhood garages surrounded by boxes or used as clotheslines. Many end up in storage buildings or even in backyards, wasting away in the elements. You don’t want to be one of those people. With that said, if there is any advice I can give you to make you feel better about buying a vertical climber machine, it is this. The vertical climber will outperform a treadmill any day. Let me explain why. Vertical Climber Machine vs Treadmill – Which is Better? There are many reasons why you would benefit more from the vertical climber machine than from a treadmill. So let’s take a closer look at our top 3 reasons below. Treadmills are mostly used for walking. Walking is a slow-paced aerobic exercise that burns calories over a longer period of time, with little muscle engagement or intensity. No upper body action here. Sure one could argue that setting an incline (if it has one) or adjusting the speed level will increase the calories burned in a shorter time period. But let’s be honest! We all would agree that walking on a treadmill is quite boring, to say the least. That is why you see people at the gym watching TV, or reading on their phones while walking. I wouldn’t exactly call that working out. To me, that is more like taking a break. Vertical climber machines simulate rock climbing for a high-intensity full-body workout. The vertical climber machine is far more engaging and requires far more muscle activation. The climber is made to simulate movements and muscle utilization to that of a rock climber. Your arms, shoulders, back, abs, and legs are all being used together simultaneously. Thus making the vertical climber far more effective at burning calories than the treadmill. The vertical climber works out upper, lower, and core body muscles simultaneously, making it the perfect full-body cardio workout machine. Trust me when I say you will build up a sweat far quicker with the vertical climber than with the treadmill. Not only will you burn calories faster, but the added intensity will activate more growth hormones and increase your metabolism, thus creating a more efficient fat burning environment. After all, this is our main objective. Burn more fat in less time. Here is an example workout routine you could use that takes only about 20 minutes but will give you better results than a 45-minute session on the treadmill. If you are a beginner, maybe try a 5-minute session to start out with and over time work your way up to 20 minutes. To begin with, I recommend a 5-minute warmup session with some light aerobic exercises and some stretching. Once you’re warmed up, use your vertical climbing machine at a light pace for about 1 minute. Next, push yourself through a high-intensity 20-second workout on the vertical climber. After that, take a 30-second breather, and continue with some light jumping jacks for about minutes. Take a quick breather if necessary and immediately perform another 20 seconds of high-intensity vertical climbs. Repeat this sequence for a 5 to 10 or even 20 minutes workout. I guarantee you will see results. I like to compare the vertical climbing machine to the rowing machine when it comes to intensity. But much like the treadmill, the rowing machine uses a lot of floor space. Both are very bulky and heavy, making it very difficult to move around or find a suitable location. The vertical climbing machine, on the other hand, has a much smaller footprint in most cases much lighter and easier to maneuver around the house. The vertical climber has one of the smallest Footprints of most workout machines, making it easy to fit in any size room. Furthermore, the vertical climber machine can be easily placed in just about any room. Its small footprint makes it ideal for corners, and if need be, a large closet would even do the trick. Compared to any decent treadmill on the market, a vertical climber is far less expensive. We all know when shopping for pretty much any product, that price is usually our first concern after quality. And let’s not forget at some point a treadmill will either break down or need maintenance. And parts and labor do not come cheap. So lets finally get started and list our top 5 best vertical climbing machines that deliver in quality and are very affordably priced. The Weslo Stepfit vertical climber machine is guaranteed to work out all parts of your upper and lower body. The Weslo comes with a large LCD display to monitor your progress and has adjustable handlebars to fit most any body size. …I highly recommend this vertical climber as it has a very sturdy build, and is the only climbing machine to offer independent resistance for arms and legs. Resistance is a huge factor when it comes to getting a good workout. And with the Weslo Stepfit, you can decide how tough you want your workout to be with easily adjustable resistance knobs to control your workout intensity. It is important to note on this climber that your arms and legs move independently and that there is separate resistance for both your arms and legs. There is one knob to adjust the arm resistance, and two separate controls to adjust the leg resistance independently. A feature no other machine has to offer. This vertical climber is 7″ in height, has a maximum 250-pound weight capacity, and a shelf to conveniently store your smartphone or media device while exercising. This climber’s base measures only 2″ by 3″ making it easy to fit in a room corner or any other area in your home. The Weslo is by far our favorite climber. The X-Factor vertical climber boasts a strong and durable steel construction with high-quality durable plastic and has a maximum weight capacity of over 300 pounds. It includes two removable resistance bands for adjusting the intensity of your workout routine and provides for comfortable and smooth operation. Recently Upgraded: I have recently discovered that X-Factor has upgraded this climber to 3 resistance levels and now includes a total of 6 resistance ropes rather than just the previous 2 ropes. The height is adjustable and is foldable for better storage options. It includes an LCD which monitors digital calories and has a step counter. The all new and improved MaxiClimber XL-1000 is a truly impressive vertical climber and a much-needed upgrade from the previous Classic model I had not originally included in my review…and for good reason. The original MaxiClimber Classic had a cheap feel to it that was flimsy and wobbly with a not so sturdy structure. It also had very short foot pedals and offered no resistance options whatsoever. Fast forward a year from writing this review, and MaxiClimber has come out with the MaxiClimber XL-1000. This new model has a very professional feel to it, very sturdy structure, full-size foot pedals, and very smooth and quiet operation. …I consider the XL-1000 to be one of the best vertical climbers for challenging yourself with 12 levels of Bi-Directional Hydraulic resistance levels and high-quality construction. But it doesn’t end there. This model now has a whopping 12 levels of Bi-Directional hydraulic resistance. More levels than any other vertical machine in this review. It is also very lightweight and can be folded for easy portability and storage purposes. This climbing machine has a maximum weight capacity of 300lbs and adjustable user height up to 6.6 feet. The XL-1000 may be a bit pricey compared to the other models in this review, but if you are looking for a good quality climber with more features it is well worth the money. This affordable cardio climber is designed to simulate the physically demanding activity of a rock climber. It is the perfect way to tone your arms, legs, abs, and buttocks. 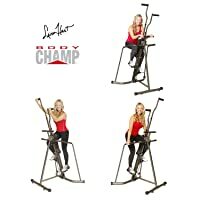 The Body Champ BCR890 offers a quality resistance system for smooth movement, a wider base for added stability, adjustable handle length to adjust to your body type or workout style, and anti-slip foam handles for more safety and comfort. Its Smart-View monitor keeps track of your steps, calories and time spent on the machine. Its exclusive bungee suspension system provides for a low to impact workout which makes it easy on the joints. The machine height can be adjusted. This machine stands a 7″ at the maximum setting. The footprint is about 4″ by 4″ and weighs 55 pounds. The maximum recommended weight capacity is 250 pounds. This machine has one resistance setting, but users claim it is enough to get your heart racing after only a minute of activity. This machine also includes an assembly video, meal plan guide, and workout video access. 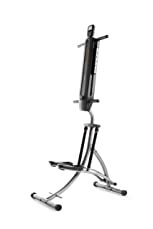 This vertical climber by Best Choice Products is both a climber machine and stationary bike. This 2-in-1 vertical climber is also foldable and therefore take up little space and is easy to transport and store away when not in use. 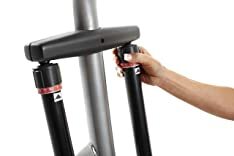 The stationary bike is built with an 8 level magnet resistance control adjustment and adjustable pedal straps. The climber uses body weight as resistance and features adjustable climbing arms. The weight capacity is 330 pounds. It also includes a display that tracks speed, time, distance, and calories. What makes Ancheer climbing machine stand out from the others is that it is a foldable unit and can be easily stored in a closet or other room. 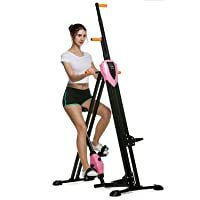 Furthermore, this 2in1 climber can also be used as a stationary bike to burn some extra calories or just to warm up before you use the vertical climber. The Ancheer vertical climber weighs approximately 50 pounds and supports a maximum weight capacity of 220 pounds. 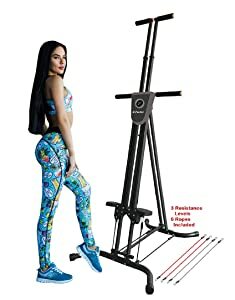 Whether you are short or tall, this climbing machine is height adjustable and can be set to meet your specific height. 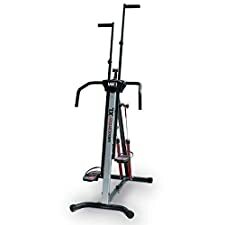 The Ancheer vertical climber and exercise bike combo is made of steel alloy making it a durable and long-lasting exercise machine. This machine does not offer adjustable resistance levels, but rather uses your own body weight to power the machine to the speed you desire. 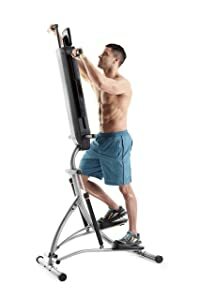 Which Vertical Climbing Machine should I Buy? Below you will find a summary table of all our vertical climbers and key features. It is important to note that I have only listed the most important features that set each machine apart. That said, I have not listed bonus or extra features such as videos, workout plans, or phone holders, etc. More importantly, I want to direct your attention to the machine itself and how it ranks as an exercise machine. That said, we will be concentrating more on the quality of the machine, durability, stability, and functionality, as well as intensity levels of each climber. We have given our best effort to compare each and every product specification, including reading through all reviews and examining the pros and cons of each machine. Based on our research and 30 years of experience in the fitness field, we have come to a conclusion and final pick. Before I explain why this decision was made let me reiterate that I have over 30 years of Fitness experience, continue to actively workout with weights and machines. I have used many machines including home gyms and commercial grade machines used in gyms and fitness Studios. My decision is not a “win all” decision for everyone. Everyone’s needs, level of experience, and goals are different. I am only here to hopefully guide you in the right direction to make a more informed decision. With that said, let me explain why I believe the Weslo Stepfit to be the best vertical climber and why I made it my #1 pick. The first thing I look for in any machine after of course structural integrity and quality is performance. Basically, what I am asking is whether or not this machine will give me the best results? In our case, we are looking for the best vertical climber that will deliver the most intensity for the best results. By results we mean what it offers for cardio health, calories burned, and muscle toning. Intensity will deliver on all three of the above! Some of these machines have added resistance controls to add intensity while other machines do not. What made the Weslo standout was that the arm and leg movements are independent. Furthermore, there is separate resistance for your arms and legs. What’s more, the structural Integrity appears good and the weight capacity of 250 pounds seems sufficient. All in all great qualities I like to see in a vertical climber. Therefore, if I had to pick a second vertical climber, I would have chosen the Best Choice 2-in1. Unfortunately, it was missing the added resistance for the vertical climber but did have 8 levels of magnetic resistance for the bike. Unfortunately, this was not added to the climber side of the machine and thus did not pass the test. 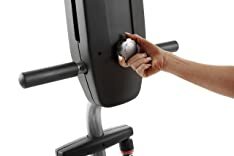 If however, you are more into the bike side of this machine and the climber being your secondary exercise, this machine might be an option for you. LATEST UPDATED MODEL: Now with 6 resistance ropes and 3 resistance levels! The X-Factor has most of the same benefits as the Weslo climber such as the LCD monitor, height adjustability, and option of adding extra resistance. But it also has the option to fold the machine for better space management and easy storage. And it has a user maximum weight capacity of 300lbs. Some may be wondering how I could have omitted the so popular and well advertised Maxi Climber (not the all-new Maxi Climber XL-1000) from our best vertical climber machine review. And I have a simple answer for that. How many of you have ever bought a product after seeing it advertised? Especially on an infomercial. Only to be disappointed after your purchase? Many of these products are overly hyped up by professional actors. And even in some cases, celebrities are used to make them even more convincing. But don’t be fooled. These are all just sales tactics. And I might say very effective sales tactics to make you, the consumers, buy their product. Basically what I am saying is don’t be fooled by the hype. Just because the Maxi Climber is the most sold vertical climber machine on Amazon, does not necessarily mean it is the best deal. Don’t get me wrong. I am by no means saying this is a bad product. I am only saying that there are better quality products available to choose from. Here is a great example of a verified user and purchaser on Amazon who replaced their Maxi Climber with a Weslo Climber and couldn’t be happier. The user indicates the quality of the Weslo Climber to be way better than the Maxi Climber. They are happy with how sturdy and how well constructed the Weslo machine is. And that it not only has the added bonus of having resistance but that the resistance is also independently driven for both arms and legs. 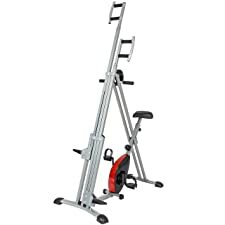 Even though these two machines are very similar in price, this user finds the Weslo Vertical Climber to outperform the Maxi Climber on all levels. I would once again like to reiterate that I would absolutely recommend the all-new Maxi-Climber XL-1000. I would probably consider it as being the best quality climber but at a higher price. There were many other vertical climber machines we evaluated but did not make my top 5 list. That said, the 6 machines on this list are all quality products and highly recommended. In the end, it is up to you to make the decision you feel is the best choice for your needs. We hope this article helps you make a more informed decision so you can find the best vertical climber machine for your needs. Best Compact Rowing Machines for Indoor Training.